Three artists have created contrasting interventions in the fabric of a derelict St Kilda building to create FALLOW, an amazing, temporary art installation. FALLOW will be open free to the public on weekends until March 31st. FALLOW evolved after respected architect Charles Justin purchased the run-down site in Chapel Street, St Kilda, planning to develop it. The adjoining houses were at the end of their lives - derelict and in a severe state of disrepair, with layers of notes, jottings and graffiti marking the walls. Squatters had left blankets, furniture and detritus behind. After Justin met artist Robbie Rowlands, whose practice explores the stability of every-day objects and spaces, the two realized there was enormous potential to utilize the houses as part of a unique, temporary art project. With the inclusion of artists Carmen Reid and Tunni Kraus, the project evolved further, with each bringing their particular vision to the project. Based on the notion that like all living things, buildings too are subject to the cycle of creation, FALLOW explores a range of interlinking topics and approaches to ideas of memory, history, ownership, stability, and materiality. 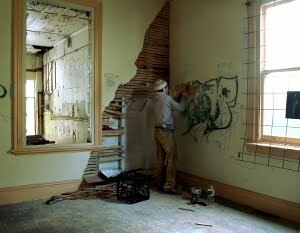 Charles Justin says, "The FALLOW project explores the idea that like all living things, buildings too go through the cycle of creation - birth, growth, maturation, degradation, decay, and eventually rebirth and regeneration. I was really interested in examining this particular time when a building is at the end of its life, abandoned, taken over by vandals and squatters, and awaiting either demolition or rebirth in the form of a new building. The project title FALLOW acknowledges this process, whereby something that is exhausted and untended eventually becomes a site of regeneration.” The three artists explored this theme by creating interventions to and with the building's structure and content. · Tunni Kraus has blackened one room with dripped ink cascading down the walls, whilst transforming the adjacent room into a brightly painted yellow maze of color. An archway carved through the fireplace unites the darkness and the lightness of these two rooms, highlighting the push and pull between belonging and owning, settling and settlement. 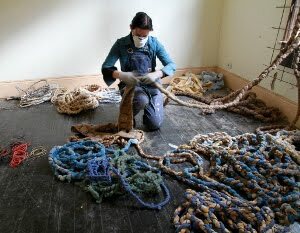 · Carmen Reid has used items found in the house - electrical cables, mattresses, and other malleable resources – to fashion ropes that embody the processes of change and imply a dreamlike escape narrative. 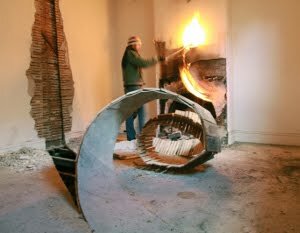 · Robbie Rowlands, has turned the barely livable into the living, cutting into walls and floors to create sculptural forms that find a tension between destruction and gracefulness. At the conclusion of the project, the buildings will be demolished to make way for a new development on the site, Art-House. 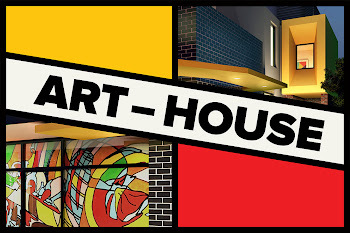 Art-House will be a unique residential development, with the highest environmentally sustainable design standards in Australia (8 stars), and a strong integration of contemporary art. Plans for this new development will be on view alongside FALLOW, in a display of the regeneration of the site to come. Art-House will also include two art murals that will reference the historic uses of the two original shop premises. In addition a photographic record of the art project will be mounted in the lobby of the new apartment, memorializing this intermediate life. FALLOW will be open free to the public on weekends until 31 March 2013. Please see www.arthousestkilda.com for times. FALLOW is presented by The Justin Art Foundation.